Discover the secret to increasing sales revenues, customer satisfaction, and growth. Learn how customer relationship management (CRM) gives you a 360-degree customer view, from pipeline and opportunity management to help-desk solutions and marketing automation. Salesforce is the #1 CRM for small business. The elevator pitch: What is CRM? 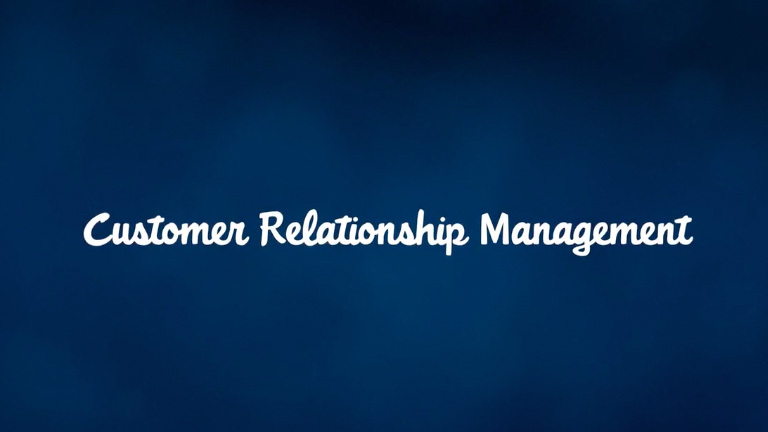 CRM (customer relationship management) lets you store and manage prospect and customer information, like contact info, accounts, leads, and sales opportunities, in one central location. But as you continue to read more below, you’ll discover that it’s not just a fancy contact list. It’s how a CRM solution uses that customer info that makes it one of the most valuable, game-changing pieces of business technology available to a small business. How can CRM help me make more sales? At the heart of a good CRM solution is something called “sales force automation,” which might sound a little intimidating, but it’s not. At the most basic level, CRM means putting account and contact information in a central and accessible place, so you accelerate and streamline the sales process. For instance, instead of being mired down in yellow sticky note reminders or buried in spreadsheets and Google Docs, you can move leads through your sales team quickly and easily, as a team. A CRM system gives you a quick way to score and route leads, track opportunities and activities, and gain visibility into deal stages and business health for both prospects and customers. And it’s literally a record of your business’ ongoing relationship with those contacts, whether they’re a customer, or if you’re trying to turn them into a customer. The details of that record can contain everything from call logs, call notes, deal conversations, and quotes, to shared files that are relevant to the customer’s needs, and more. So now anyone with access to the record can speak to the customer with confidence. Additionally, you can set it up to create daily to-do lists, schedule call alerts, trigger emails, and more. Most companies using a CRM solution find their deal cycles shortened considerably. Can a CRM solution help me find more leads? The right CRM solution can give you access to contact databases that can be filtered to find your ideal prospects and decision makers within a company, provide social data on those contacts, and deliver insights into what customers are talking about. This makes territory planning and white space analysis easier as well. A complete CRM solution also helps companies run and track marketing campaigns, including marketing communication creation and delivery automation. It can even help create forms for lead capture and track performance. And for those leads that are not sales ready, you can even automatically put them in a nurture track so that when you do call, they are more likely to buy. How can CRM help me keep the customers I have happy? CRM is also valuable for customer service, with solutions that range from self-help pages that let customers help themselves (allowing agents to focus on the tough cases), to full call centers. Your service reps can also use it to generate service tickets and keep track of all your customers’ contact with your service department. And because the entire system is connected, account reps and every other relevant department will be fully aware of customers’ issues, so everyone can be a service agent when you need them to be at those peak times. Additionally, insights about customer service issues can be shared and added to a knowledge base so that agents can help customers even faster. This kind of connected service not only shortens case resolutions times, but makes agents happier (because they have the tools to do more for customers), drives customer loyalty and referrals, and brings an overall boost to customer satisfaction. Is CRM worth it if I’ve got a smaller customer base? Yes. If you have customers, you can benefit from CRM. Even if your customer base is small, no one can keep every interaction — ones that have happened, or need to happen — memorised and organised. It’s a powerful business tool that streamlines processes, gives valuable business insights, and virtually connects employees at your company so they can collaborate as a team, in real time. That’s something businesses of any size can use. How is CRM going to save me time? A huge benefit of CRM is automating routine — yet time-sapping — tasks, which saves countless hours. This allows more time for selling. Take for example a marketing effort, one in which you want to send out an email follow-up. With a good CRM solution, you don’t have to remember which leads you want to target. You can simply create some rules around your leads and automate the marketing effort, like email campaigns and lead capture, so leads are quickly routed to reps to be either followed up with or nurtured. Email templates that can be created in the CRM solution ensure you don’t have to repeat the work or even cut and paste. The result? You can jump on opportunities more quickly and close more deals, faster. CRM also enables you to take data like pipeline size or deal size and create dashboards to help you make informed decisions at a glance. You can quickly check in on the health of deals, revenues, and more. Does CRM help my teams work better together? A CRM solution makes the same information accessible companywide. This means that almost any customer-focused activity can be better and more easily coordinated — not just within departments, but across departments, from sales to customer service. Also, because account data and activity is updated in real time, every team member — no matter where they are and what they’re working on — is always working with up-to-the-minute information on customers and your company’s interactions with them, like stages in the sales cycle, service issues, or order status. Salesforce makes collaboration between teams even easier by including Chatter, a social network designed for business productivity that allows team members to share files, find experts, and work on projects to help every employee do more with less. Is CRM customisable for what’s important for my business? Obviously every business runs differently, with different processes and ideas of success. This means a good CRM solution should be easily customisable and have an information hierarchy that puts what’s important to you, front and centre. The best CRMs feature drag-and-drop customisation capabilities, and then deliver regular upgrades automatically that won’t break those customisations — with little or no need for IT involvement. Can I add functions and features without coding and IT help? It would be hard to find a company that doesn’t use email or other basic business applications on a daily basis. Top-notch CRM offerings help you extend the power of those systems by plugging into them, integrating in a snap with programs like Outlook or QuickBooks. You can even painlessly and quickly download and integrate business apps, giving you the features and capabilities your business needs, when you need them. What are the different kinds of CRM solutions? Though there are many CRM providers, there are two main types of CRM solutions that companies can choose, depending on their needs and budget. Housed at the location of the business that uses it, on-premises solutions require the up-front purchase of servers or datacenter equipment and the installation of CRM software and middleware by IT staff. It also requires IT for ongoing maintenance and updates. In some cases, you may even need to build the software yourself. Cloud-based CRM solutions provide world-class solutions through any browser or mobile device and are instantly scalable, requiring no on-site IT staff. Essentially, CRM in the cloud allows you to pull up a login page through a browser like Chrome, Internet Explorer, Safari, or Firefox. You simply log in with a user name and password and your CRM is right there. Even better, the mobile functionality of cloud CRM solutions has cut the tethers for reps and managers on the go. How do I know if my small business needs CRM? If you’re still not sure if your small business would benefit from CRM, below are some clues that can help you in your decision. If anything on this short checklist sounds familiar, CRM might be worth exploring to help your business find, win, and keep customers more efficiently. Why Salesforce for my small business CRM? There is no shortage of CRM options. But only one continues to help more businesses succeed than any other. Salesforce customers, on average, report a growth of 27% and a boost to customer satisfaction by 42%. If you're still not sure if your small business would benefit from CRM, below are some clues that can help you in your decision. With hundreds of thousands of customers and millions of users, Salesforce is a proven choice and the #1 CRM in the world. Built on a subscription model, we are committed to our customers' success at every step. Every day. Not only is Salesforce a cloud-based CRM solution, we actually pioneered cloud computing in 1999. That spirit continues today, leading Forbes to name us the most innovative company four years in a row. No hardware. No software. Just sign on and get going. Salesforce offers many packages, including sales, customer service, and marketing software solutions, many built specifically for the needs of small businesses. Even better, they're integrated to work as one complete CRM solution for your business. Because Salesforce is 100% in the cloud, we can deliver three automatic upgrades every year based on customer input. Even better, because the apps are built on the Salesforce1 Platform, the upgrades won't break the customisations you may have made to run your business the way you want. Every year Salesforce puts out innovative tools for success that the industry can't ignore. At Salesforce, trust is our most important value. No matter how big or small a business may be, our technology gives you the same security standards demanded by our most stringent customers. It’s automatic. Every small business is different and has their own growth trajectory. Salesforce offers an extendable set of tools — from pre-integrated business apps on the AppExchange to point-and-click tools to build and customise your own apps — that give you just what you need, when you need it. So when you’re ready for growth, we can help. “What Is CRM?” from Salesforce. A lot of people in business may have heard the term CRM (or customer relationship management), but really, what is CRM? If you’re wondering what a CRM is and what it can do for your small business, here you’ll find CRM basics defined in an easy to follow Q&A format. You’ll also find helpful links to information and resources on Salesforce CRM small business solutions. Salesforce Forecasting: Sales forecasting and analytics are some of the many powerful features that Salesforce CRM offers.